Monday, July 13th, I received the above picture from Capt. Brian Castleton of the New Seaforth, half day boat out of Seaforth Sportfishing. 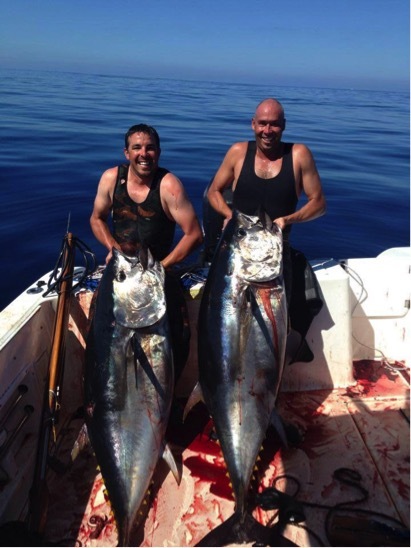 Brian (left) and his friend Eric Weldele are pictured with 181 and 183-pound bluefin tunas respectively. 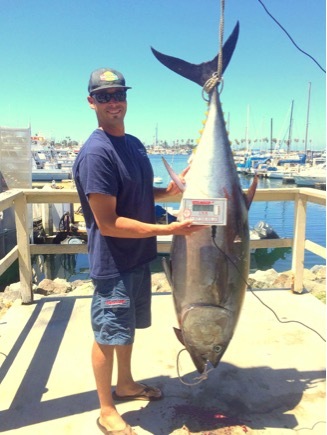 Both fish broke the previous record of 173.3, just set in June, by Aaron Shook. I posted the picture on the So Cal Salties Facebook page and it literally blew up my page. At last check, over 43,000 people saw the post because of all the likes and shares. I didn’t even know that you speared. Was going after a record the plan? I have been free diving since I was 13 years old. I started diving for lobster when I was 16. I played with a pole spear during those years. It got serious though when shooting a white seabass became a goal. It took me 2 years to get my first one when I was 20 years old. Back then, there wasn’t much info on the internet. I just learned through a lot of trial and error. I’ve learned a lot since then. Last year, I started the quest to kill a tuna. I’ve come a long way in terms of gear too. Today, I use a Sea Sniper. I love my gun. It’s done me well for a lot of years killing white seabass up to 60-pounds. 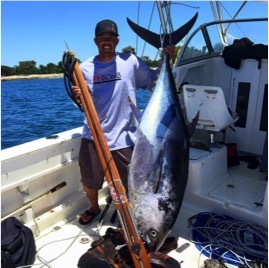 It has plenty of hitting power and range…enough to finish off a 181-pound bluefin tuna! Can’t say enough about these guns. OK, so this was a planned trip then. How did it come about? I had been trying to get in the water for over a month to go try and shoot one but the weather and my work schedule kept that plan at bay. Saturday the 11th, my buddy Aaron Barnhill (captain of long range boat, the Shogun), also a spearo called and said there were big ones around and that there were a lot of lazy fish (slower moving and easier to shoot). I had the upcoming Monday off and the days couldn’t tick by fast enough. The plan was to take our panga, but my buddy John Gieletta said he would drive us on his boat the Lil Bit. So when Monday rolled around, how did the hunt play out? We left at 6am, and it wasn’t long before we were in the zone and saw our first batch of fish. I was a little bit surprised how fast we found them. I didn’t even have my suit on yet. I could not get my suit on and gear together fast enough and they sunk out. Luckily, they came up again right on cue when I had gotten all my gear ready. Eric and I jumped in on the school. I missed my first shot on the fish (excited nerves or something). I jumped back in on the fish again, sunk down 40-feet or so, lined one up and pulled the trigger. I hit the bluefin in the shoulder. It rolled on its side and took off down and out. I was hung up in my float line for a brief second, but was able to untangle my gun and head for the surface. Eric made a great shot. His shot broke the fish’s spine and it was on the deck in 5 minutes. Then we went to chase down mine. My fish swam northwest for about an hour until it died. Once we were on top of it, I shot it again to make sure it was secure. That thing had to be bleeding like crazy. 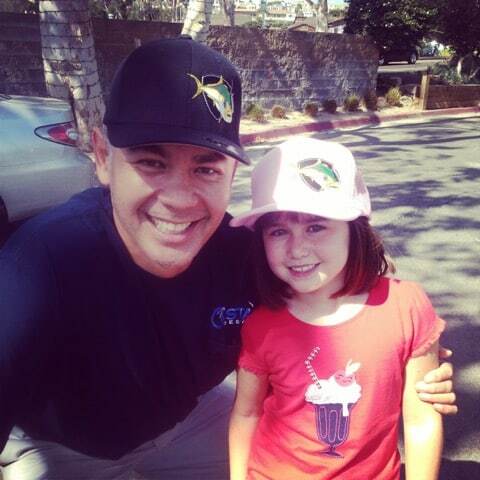 Weren’t you afraid of sharks? Well, once we had both fish on deck, we drank a beer and bled both fish. Then John took that picture of Eric and I that I had texted to you (above). We were pumped to get back to the landing and weigh the fish. When I had first shot it, my guess was it was about an 80-pound fish. When I saw it laying on the deck (and I had to lift that sucker up for the picture) I knew it was well over 80-pounds. My guess was it was at least 150. We sped back to the landing. Along the way, after we had kind of cleaned up ourselves and the deck, we stopped for a few pictures for Fin Bomb. I want to thank them for supporting my spearing efforts. Once we got back to Seaforth, we weighed them up and headed home. We cut the fish and iced them down. 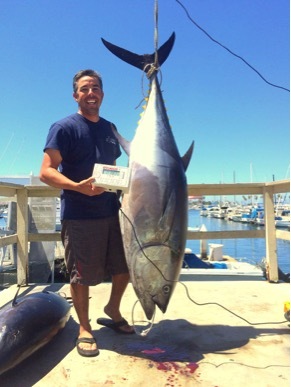 Late that night, I got a call from a buddy telling me that Eric and I have the two largest bluefin ever shot in California! Not sure if we are going to submit them or not, but both fish were weighed on the IGFA certified scale at Seaforth. Over the next few days, I smoked both collars and I am in the process of canning both fish. As far as what’s next…maybe Asuncion Island or Puerto Vallarta for the chance to shoot a big yellowfin tuna. Wow, thanks so much for sharing your story Brian. Congrats again on the achievement and best of luck on your next adventure!